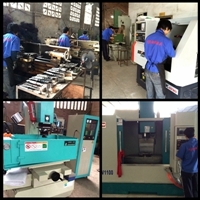 Henghui Precision Mold Co.,Limited is located in the heavy industry center of China,Chongqing. Company has a registered capital of 1 million yuan and specialize in producing,selling,reaserching and developing all kinds of molds,fasteners.These products are widely used in automobile and motorcycle manufacturing ,aviation industry and shipbuilding.Fatheners include standard parts, hot bolt rammers, high-strength bolts , nuts. Our fasteners products can meet DIN,ASME/IFI/ANSI,Q,PEM,JB,EN,ISO,JIS,HG,NFE,UNI,BS.Also the tolerance of our molds can be controlled within 0.01mm..The Quality Department strictly control the quality with ISO:9001 system. We are improving our quality management systems, focusing on brands, standards, service, and performance, and to enhance our sense of social responsibility.Our company wins good fame for reasonable price,high quality and good service. Welcome your presence.